On the Holy Translators, Mesrob Mashdots to Shnorhali - how to make it real today. The "ridiculous' lesson of the Widows Offering. Sermon delivered by Fr. Vazken Movsesian on October 9, 2011. 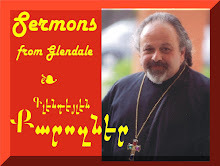 Recorded LIVE at the St. Peter Armenian Church and Youth Ministries Center. Reading by Madilyn Smith. English Sermon begins at minute 12:05.